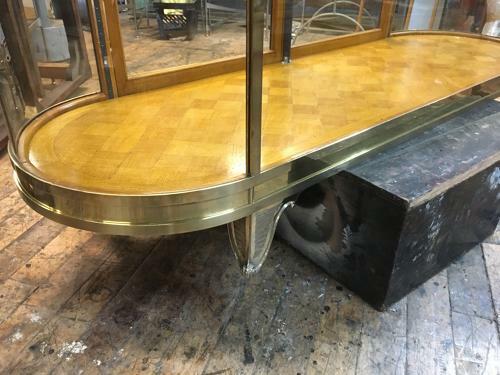 This beautiful brass counter was designed by D and A Binders. The frame on the outside of the cabinet is top quality brass, and all the glass in the cabinet is toughened safety glass. It has a functioning lock to keep your products safe, and a beautiful parquet floor, as well as adjustable glass shelves supported by Victorian style brass shop brackets. This can be made any size or shape, and the brass can be treated to give the counter an antique effect.